Cecilia E. Gerber is a Professor of Physics at the University of Illinois – Chicago. 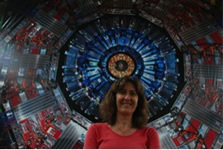 Her research is centered in the experimental study of hadron collisions at the highest energies available. Her work involves the development of semiconductor detectors that precisely track the passage of charged particles and the elucidation of the characteristics of the production processes of top quarks and searches for new physics that decay preferentially to top quarks. Prof. Gerber has published more than 300 papers in leading scientific journals and has advised a total of 14 graduate students and 10 undergraduate students. She is an elected member of the American Physical Society, University of Illinois Scholar, Fellow of the UIC Honors College, and UIC 2011 Researcher of the Year. She received her PhD in Physics from the University of Buenos Aires (Argentina) in 1995, and was a research associate at Fermilab prior to joining the faculty at UIC in 2000.